A woman in New Zealand has struck it lucky after she took an April Fool's Day offer seriously and landed herself a new set of wheels in the process. 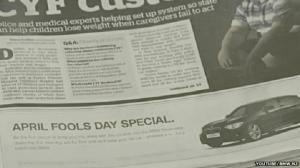 While many dismissed an "April Fool's Day special" advert (pictured) in the New Zealand Herald newspaper – which promised a brand new BMW to the first person who turned up to the showroom with their own car and the advert in hand – as a mere joke, Tianna Marsh saw that she had nothing to lose by giving it a go. She arrived in her 15-year-old station wagon with the ad in hand and was promptly handed a set of keys to a brand new car worth £25,000. It is one of many stories in which car dealerships have got involved in the April Fool's Day fun. And though this is the one day of the year that looking like a fool is understandable, for the other 364 car dealers can save their blushes by having a road risks insurance or combined motor trade insurance policy in place that will ensure they are covered against unforeseen and potentially costly mishaps that affect their business. A spokesperson from the BMW dealership in the Auckland suburb of Newmarket said: "[The advert] definitely appeared too good to be true … We wanted to turn the tables and reward the first person who was willing to take the chance." The dealership, which published a video of the story on YouTube, added that Ms Marsh's old wagon will now be sold off at auction, with the proceeds being given to a charity which helps disabled children.